Today is 10 Days later an update to my baby bird story. 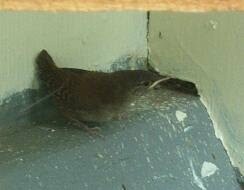 As we were leaving for our Tuesday night meeting we heard a tiny chirping coming from the corner of our porch. Looks like at least one of the baby bird survived. 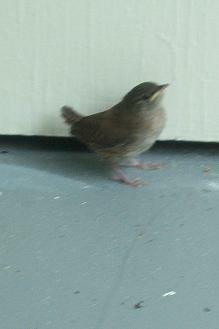 He couldn't fly very well , and he was staying close to the porch. His little legs were still wobbly. He was trying hard to be friendly, but I think he was too scared. I got a quick snap shot of him. Is that a cute baby bird or what? very interesting what happen to the rest of the birds? They are under the bush in the front yard. When they see us they run under that bush.